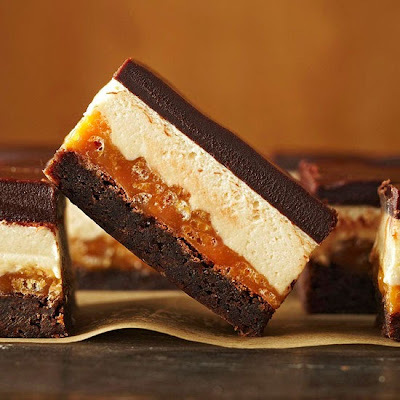 First comes the brownie layer, then the crunchy caramel layer. Next up is a rich peanut butter nougat topped off with velvety melted chocolate. Put them all together for pure dessert bliss. For smooth, smudge-free sides to your bar, hold a thin-blade knife under hot water; wipe the blade dry and cut the bars. 1. In a medium saucepan combine unsweetened chocolate and 1/2 cup butter. Cook and stir over low heat until melted and smooth. Remove from heat; cool slightly. Meanwhile, preheat oven to 350 degrees F. Line a 13x9x2-inch baking pan with foil, extending the foil over edges of pan. Grease foil; set pan aside. 2. For brownie layer, stir 1 cup of the sugar into chocolate mixture. Add eggs, one at a time, beating with a wooden spoon after each addition just until combined. Stir in vanilla. In a small bowl stir together flour and baking soda. Add flour mixture to chocolate mixture; stir just until combined. Pour batter into the prepared pan, spreading evenly. Bake for 15 to 17 minutes or until edges start to pull away from sides of pan. Cool on a wire rack. 3. For caramel layer, in a large microwave-safe bowl combine caramels, 2 tablespoons of the evaporated milk, and the water. Microwave on 100 percent power (high) about 3 minutes or until caramels are melted, stirring every 30 seconds. Stir in rice cereal. Spread caramel mixture evenly over brownie layer in pan, spreading to edges. Place pan in freezer while preparing nougat layer. 4. For nougat layer, in a medium saucepan combine the remaining 1-1/4 cups sugar, the remaining evaporated milk, and 1/3 cup butter. Bring to boiling over medium-high heat; reduce heat to medium. Simmer, uncovered, for 5 minutes. Remove from heat. Stir in marshmallow creme and peanut butter. Pour marshmallow mixture over caramel layer, spreading to edges. Place pan in freezer while preparing chocolate layer. 5. For chocolate layer, in a small saucepan cook and stir semisweet chocolate pieces, 1/4 cup butter, and whipping cream over low heat until melted and smooth. Pour chocolate mixture over nougat layer, spreading to edges. Cover loosely and chill for 2 hours. Using the edges of the foil, lift uncut brownies out of pan. Cut into brownies. Store, covered, in the refrigerator for up to 3 days.